The topic of battery degradation was raised by some e-Golf owners in the California desert and Arizona. 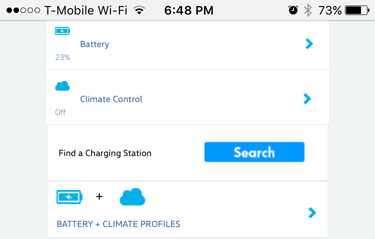 I don't believe that the e-Golf has any indication of degradation like the Nissan Leaf does, so here is a way for you to track your own usable capacity over time. The data above is from October 3, 2015. It shows that I drove 29 miles with an efficiency of 4.2mi/kWh and used exactly 5/16ths of the battery energy. 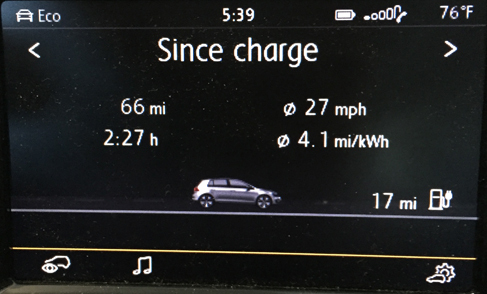 Today, I took my daughter to all her Saturday activities in the e-Golf and drove 66 miles at 4.1mi/kWh and used about 12.3/16ths of the battery capacity, at least according to the gauge. To get another data point on the SOC, I opened the CarNet web site on my phone. The site will render the page differently depending on the aspect of your browser window and if it is narrow it will magically show the battery level in percentage, in a tiny font. My gauge reading of 12.3/16 would leave 23.125% battery remaining. Obviously, my car did not gain 846 Wh of usable capacity in 8.5 months time. These calculations are not very precise because they are based on data that is only displayed with only two significant digits. Just to illustrate the point, if the efficiency value just ticks over from 4.1 to 4.2, that's a 2.4% change. If you apply that change to the battery capacity, it's basically +/-0.5kWh in the final calculation, just from that one item's contribution. So, is this all useless because it's so imprecise? Well, not really. If you were to do this calculation regularly, maybe monthly, you would be able to plot them over time and since they would be randomly erring high and low you could fit a trend line to the data. So, the bottom line is that if you really care about your battery degradation, you're going to have to work for it to get a good idea - at least until someone figures out how to extract the car's opinion of its own usable capacity from the CANbus. Last edited by miimura on Fri Jul 14, 2017 4:37 pm, edited 1 time in total. Are you going to try plotting estimated capacity over time? I'd like to know how it pans out and whether it's worth undertaking. BTW, not much use to me, since I avoid dealerships for anything non-warranty like the plague, but I think they can tell you actual battery state-of-health during a normally scheduled service using VW diagnostic software. A DIY alternative similar to Ieaf spy would be great. Since I bought mine, information on how I'm tracking for the 8 year or 100,000 mile / 70% battery warranty would be nice to have. I have 6200 miles on mine, they are welcome to come to L.A to test and add it to their baseline. Avg temps are a little bit higher here year round in the San Fernando Valley. Age of battery may affect degradation too, in addition to charge/discharge cycles. 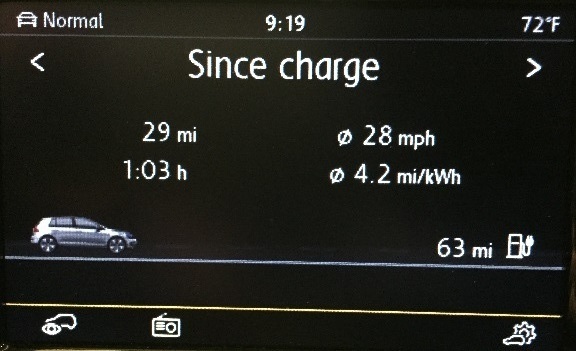 My Guess-o-meter now shows 125 miles of range fully charged where as it used to show 129 miles. I drive the same routes, same destinations, no AC or other accessories running. If it's correct, that's about a 3% loss in 9 months and 6000 miles. I have performed the calculation a few times over the past few weeks and I'm a bit disappointed by the numbers I'm getting: 19.9 kWh. The car only has 10,000 miles on the odometer and I've been careful to keep the battery less than fully charged most of the time and rarely quick charge. Then again, I didn't check the battery capacity when new, so maybe it hasn't changed much since I got the car. Drive your car so that you have 1/4 to 1/8 charge left on the fuel meter, and then take a picture of your infotainment center for data, and lets see how many miles you drove, how many miles left on the charge, and your miles per kwh shown. That should give you a ball park figure for still useable capacity in your battery. Of course I would think that the mores miles per kwh you get, the less rounding error you get from the guess o meter. 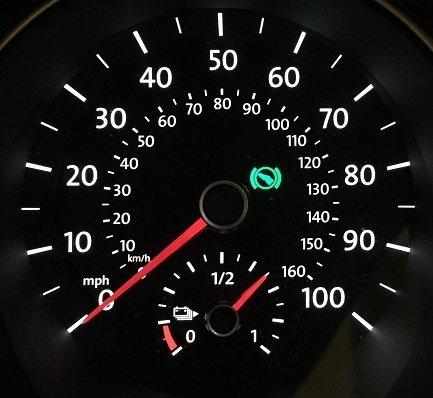 If you follow my method above, you don't use the number from the guess-o-meter, just the actual miles traveled, stated efficiency, and battery level used. I used your method. My previous post had a typo. My car's battery capacity is calculated at 19.5 kWh (not 19.9). I have seen this same number over the course of a month. July 1 calculation: 87 miles, 5.5 miles/kWh efficiency, 19% battery status: 19.5 kWh capacity. July 21 calculation: 83 miles driven, 5.9 miles/kWh efficiency, 28% battery status: 19.5 kWh capacity. So at least it's stable over three weeks (as you would expect). I have seen with other lithium ion batteries that the battery status is artificially low and can be reset to the correct value when the battery is fully drained. Maybe I'm not draining the car battery enough and if I take it down to, say 10 miles remaining, I'll get the true capacity to be shown? I have read somewhere, not sure where, that if you take your car down to 5 miles remaining on the battery, and then give it a full level 1 or level 2 recharge, completely topped off, that it resets to the correct value. Supposedly it's the factory reset method. I just drove 35 miles with an average efficiency of 5.6 miles/kWh, 72% battery capacity: Usage capacity is calculated as 22.3 kWh. Hmmm - when I drain the battery more, I get 19.5 kWh calculated capacity. I realize there are errors because VW is not giving us enough precision in the data, but still, this is a (22.3-19.5)/22.3 = nearly 13% difference is capacity calculation. Is there something funny going on with the way the e-Golf estimates battery capacity? it looks like miimura saw a similar trend with more calculated capacity at high battery charge state as compared to low battery charge state. Does anyone know how the battery experts measure battery capacity? I suspect it involves test equipment most consumers don't own.